At ActionCOACH, we understand that marketing is critical to coach success and building the brand. There is no question that the great results we get for our clients are the most important advertising we have. 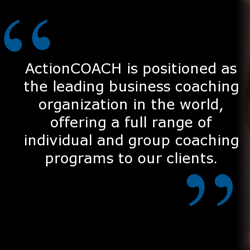 Helping business owners build profits, solve issues with their teams and get control of their time so they have balance in their lives are all massive benefits that make ActionCOACH clients raving fans of our services. Such success begins with following the coaching systems, using the tools and ensuring a high level of accountability with clients. The results follow and the client is excited to share the success with other business owners. Referrals from enthusiastic clients are great marketing from the best sales people a coach or firm can have – satisfied customers! We know that different coaches have different networks, experience and styles. Accordingly, we work with every coach to focus on marketing strategies that will be most effective for them. With our systems and measurements, it is easy to plan the activity, see the results and focus the marketing efforts. As an ActionCOACH franchisee, you will benefit from both a team and a culture that embody support. It is the constant learning, growth and sharing among our franchisees that makes ActionCOACH strong. This includes not only our pre-training, induction and post-training programs, but also the local support of your Master Licensee team and your own accountability coach, the input of your fellow coaches, the power of our two annual conferences and a host of conference calls and training tools. Prior to starting your coaching business, you will be required to complete ActionCOACH's 4 week pre-training program, our 10 day Induction training school. These programs are designed to educate each new franchisee on all aspects of bringing on new clients and coaching them successfully. Once you're back from training, you get hands on support starting your business. From daily calls to detailed activity planning to seminar supervision and joint sales calls, we work closely with you to ensure a smooth start to your coaching practice. For firms, we also work with you as you select office space and assemble the team for your new coaching business. At ActionCOACH, we believe strongly in congruency, so every franchisee has an accountability coach to support and guide them as they start their business. With years of experience working with coaches, the accountability coach is a key resource for new franchisees. Help is only a phone call or quick email away. Get in on the ground floor of a new industry with the undisputed industry leader. Enjoy the benefits of a very high margin, low overhead, white collar, business to business franchise model. Leverage the business knowledge, training, tools and support developed by 18 years of coaching thousands of businesses. Become the leaders of their local business communities. Have the option to build a powerful professional services firm and create a legacy for their family and community. Click on Request Information for FREE info on how to open a ActionCOACH franchise today! Please Note: This ActionCOACH franchise opportunity and other franchise business opportunities, businesses and franchises for sale on this web site are not to be considered as an "offering", "franchise offering", suggestion or recommendation by Franchise Leader™. This advertisement depends entirely on the truthfulness of the information provided by our advertisers which includes, but is not limited to, franchisers, franchise brokers, franchise consultants and business brokers. Franchise Leader™ recommends that you consult a lawyer, financial consultant, accountant or professional advisor before buying a franchise or business opportunity or any type of business. By using this form or any part of our website, you have agreed to all terms and conditions of Franchise Leader™. Please review our Terms & Conditions for more information.